In the next synodical term, 2016-2018, Lutherans across Australia and New Zealand will celebrate, commemorate, and focus their creative energy on the church God is building project task management software. This is the vision of 50.500 faith.freedom.future, a church-wide campaign launched this afternoon by LCA Bishop John Henderson. Next year the LCA will celebrate the 50th anniversary of church union. In 2017 the worldwide church will commemorate the 500th anniversary of the Reformation. International, national and local events and initiatives are already planned, but 50.500 presenters Larissa Helbig and Linda Macqueen said the 50.500 team needed ‘your creative input to make the whole campaign really sing’. The 50.500 initiative points back with thanks to God for his past blessings to us and generations past, Linda said, ‘but also looks forward to how he will bless us in the future, and on how he will use us to bless our communities’. There will be a strong commitment to be generous with the gospel we have received, not keeping it for ourselves, Linda said to the 400-plus delegates. The 50.500 website will be launched soon. There, congregations, communities and individuals will be able to register events and activities, and use the ideas of others to inspire their own. 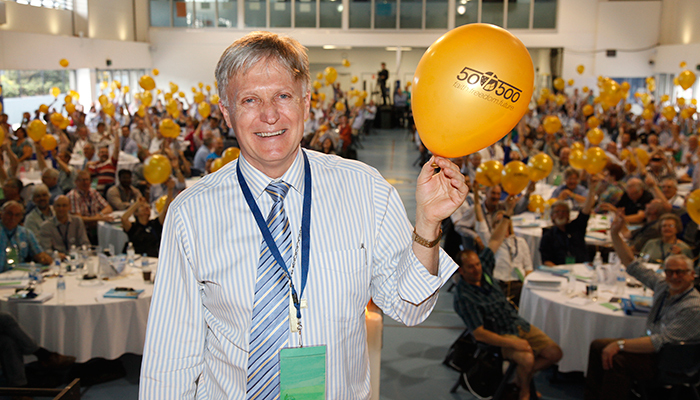 ‘It’s going to be an exciting three years for us Lutherans in Australia and New Zealand’, Larissa concluded, before inviting Bishop Henderson to unveil the 50.500 banner. Delegates celebrated by waving 250 yellow balloons.